In ArmA II, you\'re part of an elite squad of American soldiers sent behind enemy lines to restore peace to Chernarus, a Soviet country ripped apart by civil war as warring rival factions fight to take control of the troubled state. In an epic story full of plot twists and turns, it becomes clear that the troubles plaguing Chernarus are deeper than anyone thought and the battle intensifies to extreme levels. 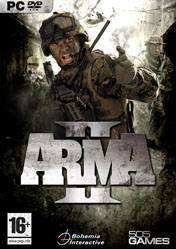 Building upon the foundations laid by its predecessor, ArmA II features refined graphics; unscripted AI opponents that ensure no skirmish ever plays out in the same way; 225sq km of game play area including more than 50 different towns and villages, alongside lush forests and wind-swept beaches; 136 different vehicles variants including helicopters, tracked armoured vehicles, boats and even bicycles and 81 weapon variants. There are no comments yet about Arma 2 . You can be the first one!